Gouti is a project management tool designed for the project manager and his collaborators. It's a ready-to-use solution, pragmatic and adaptable to your needs. Easily organize your various tasks, assign them to your collaborators and follow their progress at a glance. Make GANTT or macro-planning views and use them to communicate about your project. 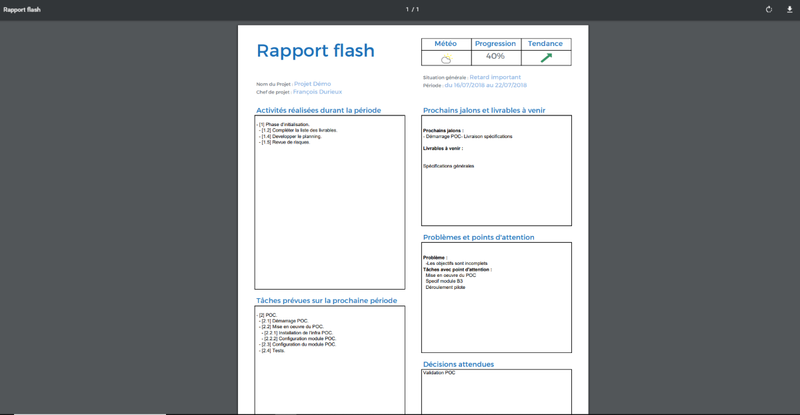 You also have pre-filled reports, like the flash report, editable and achievable in few seconds in PDF format. Gouti takes into account the interests and the problems of the project manager to accompany him daily in his approach, as a conductor, to carry out his projects, by collaborating with his team and providing him with the key elements he needs.